BSP Pharmaceuticals S.p.A. is proud to announce Its participation to the 9th European edition of World ADC Summit. This year the Summit will be locate at London. 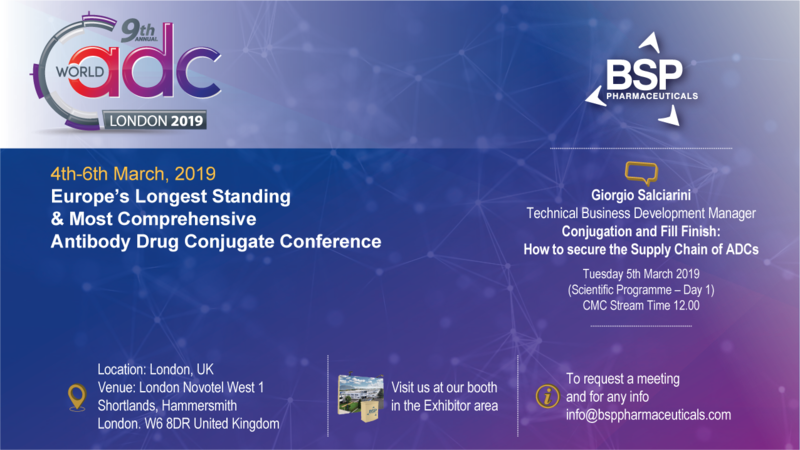 The World ADC Summit of London is Europe’s leading antibody-drug conjugate conference and It covers comprehensive every element of ADCs development. World ADC Summit of London covers cutting edge science and transformative insight enabling the companies to more clinically safe and efficacious ADCs. Across three days, this comprehensive programme will cover every element of ADCs from discovery, development, manufacturing and clinical. During this edition of the Summit, various Pharmaceutical companies will present their new scientifically novels on ADC research and openly talking about their experiences on how to validate the next generation of tumor associated antigens, harness preclinical learning to confidently translate into the clinic and confidently scale up from phase II to phase III manufacturing.